The Anadarko Basin is a mature hydrocarbon producing region which remains one of the most significant and active exploration and development areas in the onshore US. TGS’ industry leading geoscience data position in the SCOOP/STACK play offers clients over 5,700 km2 of contiguous, modern, high density and high fold 3D data in this prolific trend. 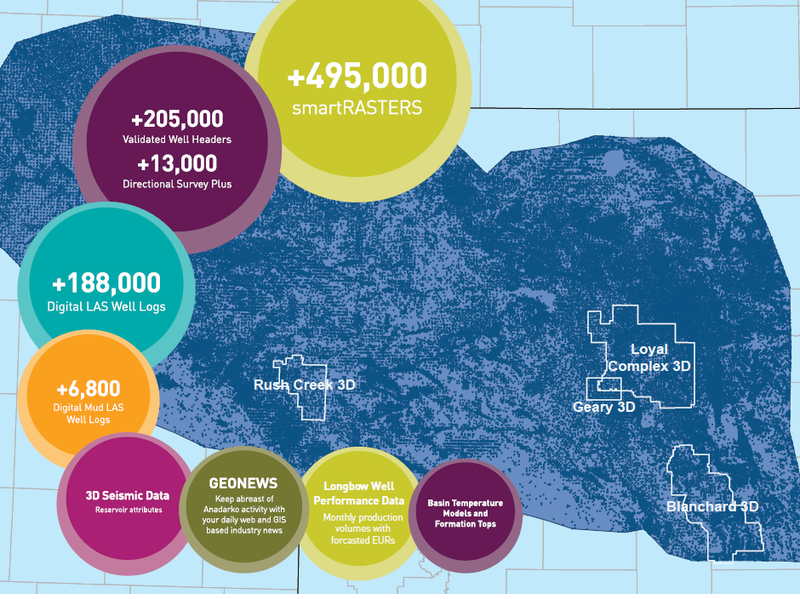 TGS’ seismic surveys are accompanied by its extensive geologic products database in the SCOOP/STACK, comprising data from over 100,000 wells and multiple interpretive products including an innovative Basin Temperature Model. Approximately 1,500 km2 in Major and Woods counties Oklahoma, north of TGS' Canton 3D and Loyal Complex 3D. Approximately 1,400 km2 north of TGS' Loyal Complex, targeting the high potential Mississippian Chester, Osage and Meramec intervals in the heart of the prolific SCOOP/STACK play fairway. North of TGS' Loyal 3D Complex, this survey covers 777 km2 predominantly in Garfield County in the state of Oklahoma, targeting a high potential area in the core of the prolific Mississippian Chester and Meramec intervals of the SCOOP/STACK play fairway. The Loyal 3D survey is located on Oklahoma’s STACK trend spanning approximately 1520 km2 over Kingfisher and Grady counties. This project is designed to image subsurface targets from Pennsylvanian through theOrdovician. Loyal lies in the core of the gas liquids window targeting the prolific Meramec, Cana Woodford, Woodford Shale, and Hunton intervals. 200 km2 located southwest of our Loyal 3D complex, this high-resolution Oklahoma data lies within Blaine, Canadian and Kingfisher counties. Blanchard 3D spans approximately 1475 km2 over Grady and McClain counties.The survey lies in the core of the South Central Oklahoma Oil Play (SCOOP), which targets the prolific Woodford Shale and the emerging Springer Shale play. Blanchard 3D is designed to image subsurface targets in this complexly faulted area. TGS offers the industry’s largest digital well log library, available online via R360 ™, specialized data integration services and custom interpretive data solutions to meet the specific needs of each of our clients. The combination of our expertise, experience, and data library makes TGS the right choice for all of your geological data needs.